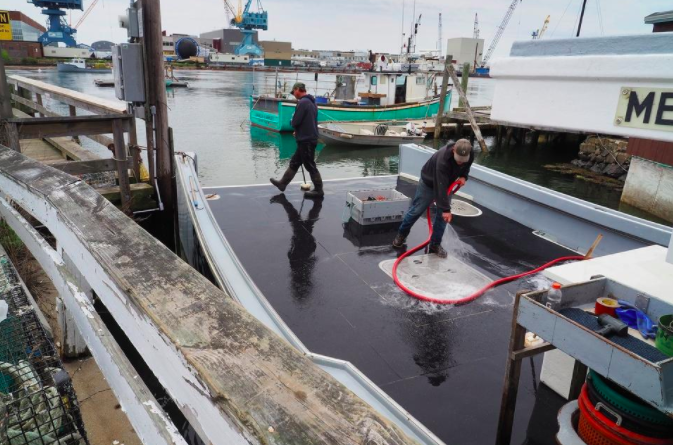 Lobstermen Ben Paige and Nick Young tidy the Agnes D. while docked at the Government Street Wharf in Kittery on Wednesday. The wharf is in need of serious repairs and the town is seeking voter approval to spend $450,000 for a replacement. The Government Street Wharf, located between the Corner Pub and Anneke Jans, is in need of repairs and the town is seeking voter approval to spend $450,000 on a replacement. 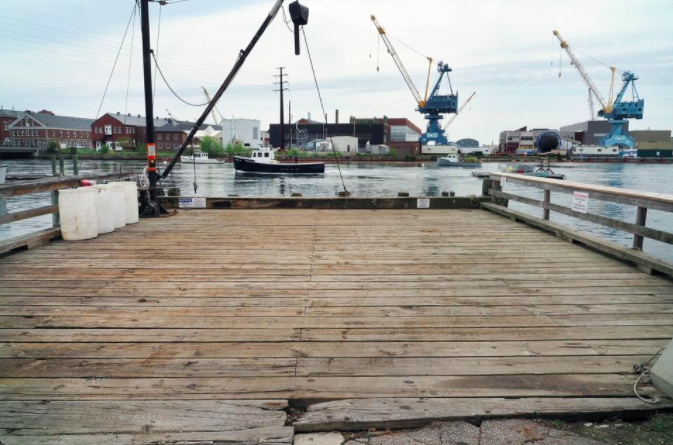 KITTERY, Maine — A 2017 assessment of the Government Street Wharf determined there are “several critical condition issues” that make the structure unable to handle loading normally associated with commercial pier use. The assessment by Baker Design Consultants stated the wharf will only be serviceable for an estimated five to 10 more years if basic repairs are made. In June, the town will ask voters to authorize the Town Council to transfer up to $450,000 from unassigned funds for a complete replacement of the Government Street Wharf. The wharf was built around 1955 and is currently used by commercial fishermen, and for lobster trap and bait deliveries. When the 2017 assessment found it to be structurally deficient, a weight restriction was posted for safety purposes, reducing the usability as a working waterfront. Recent storms have also exacerbated the condition of the structure, the town said. Kittery Port Authority Chairwoman Kelly Philbrook said for the last several years, it’s been listed as a Capital Improvement Program project, but after last year’s assessment, the KPA asked the town if local funding could be sped up. The only way to do so is through the ballot process, she said. The condition assessment found the wharf has severe deterioration of pile caps, at least six fender piles in moderate to very poor condition, presence of dead wood beneath the structure that would accelerate deterioration and missing shims. The town applied for a Small Harbor Improvement Program grant through the Maine Department of Transportation in February, but Town Manager Kendra Amaral said those funds may not be awarded until 2020. The grant would provide up to 50 percent state funding toward the design and construction of the wharf. Amaral wasn’t aware if the funds can be retroactively applied and noted the town may not be able to wait that long on the project. Baker Design Consultants’ assessment estimated the replacement cost is between $300,000 and $350,000. If voters approve the wharf replacement, the town would go out to bid for the project this summer and hopefully begin construction in late fall. Town Meeting will be held June 12 with voting from 8 a.m. to 8 p.m. at the Kittery Community Center.